If you’re Swedish, you should be feeling pretty proud of yourself right now. Here's a few reasons why. It’s really easy to do business in Sweden. So much so that it now ranks number one on the Forbes’ annual list of the Best Countries for Business. Compare that to economic powerhouse the US, which is in 23rd place. Forbes graded 139 countries on 11 factors including, innovation, taxes, technology, levels of bureaucracy and stock market performance. The World Economic Forum publishes a Global Competitiveness Index every year, and this year it put Sweden in sixth place. “Growth has been robust, at 3.7 percent in 2016, and the country has managed to significantly decrease its deficit in 2015, jumping 30 places to 22nd on this indicator. Sweden is placed 4th on the World Economic Forum’s Global Gender Gap Index 2016, having closed more than 81% of its overall gender gap. It has recently seen an increase in female legislators, senior officials and managers, and has reached parity in the number of women in ministerial positions. 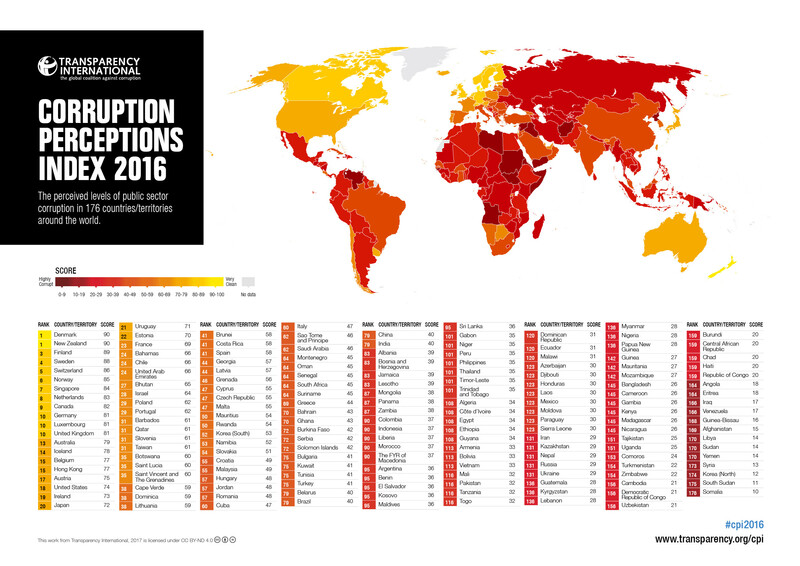 Sweden has a low level of corruption and ranks 4th in Transparency International's latest Corruption Perceptions Index, which measures the perceived levels of public sector corruption in 186 countries. The European Commission’s European Innovation Scoreboard 2016 places Sweden in top place. Alongside Denmark, Finland, Germany, the Netherlands, Sweden is an “Innovation Leader” with innovation performance well above that of the EU average, according to the study. Innovation performance is measured by average performance on 25 indicators. Sweden leads in human resources - the availability of a high-skilled and educated workforce - and quality of academic research. The power of a passport is defined as how many countries the holder has unfettered access to. Germany and Sweden top the list, with only one country between them. This makes the Swedish passport the second most powerful in the world. The ranking, compiled by Henley & Partners, a citizenship and planning firm, takes into account how many countries can be visited without applying for a visa. German passport holders can travel to 177, out of a possible 218, while Swedes can visit 176. Sweden ranks third overall in the Global AgeWatch Index 2015, which measures the quality of life for older people. Sweden’s strengths lie in the capability of its older generation – they have above average employment rates (73.6%) and levels of educational attainment (68.7%). Older people are highly satisfied with safety (73%), civic freedom (94%) and public transport (65%). Sweden also ranks high on the income security domain (7), with 100% pension income coverage and an old age poverty rate (5.3%) that is 3% below the regional average. Swedes speak very good English, and are only beaten to the top by The Netherlands and Denmark. The ranking, which is compiled by language education company Education First, is the result of testing millions of people all over the world on their language skills. English has been a compulsory subject throughout primary and secondary school in Sweden for the last four decades, and daily life in the region is characterized by constant exposure to English through non-dubbed English-language media, particularly on television. It’s no surprise then, that Sweden tops the ranking this year (78.3 points), of the RepTrak reputation ranking. It’s a great place for families – it has 16 months of parental leave and free day care services - it invests in green living, has favourable economic growth, is a safe country for women, has transparency in the media and last, but by no means least - it's a beautiful country.